Community Question Answering (cQA) sites have emerged as platforms designed specifically for the exchange of questions and answers among users. Although users tend to find good quality answers in cQA sites, they also engage in a significant volume of QA interactions in other platforms, such as microblog networking sites. This in part is explained because microblog platforms contain up-to-date information on current events, provide rapid information propagation, and have social trust. Despite the potential of microblog platforms, such as Twitter, for automatic QA retrieval, how to leverage them for this task is not clear. 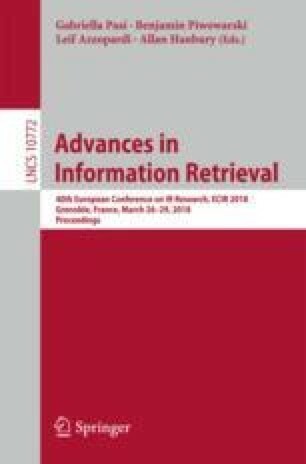 There are unique characteristics that differentiate Twitter from traditional cQA platforms (e.g., short message length, low quality and noisy information), which do not allow to directly apply prior findings in the area. In this work, we address this problem by studying: (1) the feasibility of Twitter as a QA platform and (2) the discriminating features that identify relevant answers to a particular query. In particular, we create a document model at conversation-thread level, which enables us to aggregate microblog information, and set up a learning-to-rank framework, using factoid QA as a proxy task. Our experimental results show microblog data can indeed be used to perform QA retrieval effectively. We identify domain-specific features and combinations of those features that better account for improving QA ranking, achieving a MRR of 0.7795 (improving 62% over our baseline method). In addition, we provide evidence that our method allows to retrieve complex answers to non-factoid questions. J. Herrera and B. Poblete have been partially funded by the Millennium Nucleus Center for Semantic Web Research under Grant NC120004. J. Herrera is partially funded by the CONICYT Doctoral Program and D. Parra is funded by FONDECYT under grant 2015/11150783. J. Herrera, B. Poblete and D. Parra have been partially funded by FONDEF under grant ID16I10222.